It is a great book that looks at the need to change your perception of things. It teaches you how to break your mental frames and construct new ones. It mainly talks about organizations, yet the techniques can be useful in personal life.Although organizations start with a simple idea, they are complex and there is not one direct cause to a problem. People interpret different situations differently because there are different languages, different perspectives (frames), and different alternative ways to reading what is going on and we would be missing the insights each one generates if we do not acknowledge them and try to benefit from them. To be able to deal with situations effectively, we should be able to form sophisticated interpretations of them through looking at them from different perspectives through REFRAMING. It will enable us to generate different insights and discover new layers of meanings that will help us develop comprehensive understanding of the situations.A frame is defined as a mental model: a set of ideas and assumptions that you carry in your head to help you comprehend and negotiate a particular "territory". It is a coherent set of ideas forming a prism or lens that enable us to see and understand more clearly what goes on from day to day. A good frame makes it easier to know what you are up against and, ultimately, what you can do about it. We use different frames when dealing with friends, parents and managers. Managers who are polite with their boss might be harsh with their subordinates and become very nice and kind when playing with their children!Bolman and Deal argue that framing involves matching mental maps to circumstances and reframing requires another skill: THE ABILITY TO BREAK FRAMES. They also argue that they have consolidated major schools of organizational thoughts into a comprehensive framework encompassing four perspectives. They introduce those perspectives as four frames: structural, human resource, political and symbolic.The structural frame describes how to organize and structure teams and groups to get results. It is assumed that organizations are most effective when rationality prevails over subjective perspectives. Metaphorically, the organization is a systematic machine in which the various parts fit together to work smoothly. The human resource frame looks at how to tailor organizations to satisfy human needs, improve human resources management, and build positive interpersonal and group dynamics. Metaphorically, the organization can be thought of as a family.The political frame looks at how to deal with power and conflict, build coalitions, have political skills and deal with internal and external politics. Power is one of the central features of this frame. It is assumed that different interests occur naturally within the organization. Metaphorically, the organization can be thought of as a jungle. The symbolic frame is about how to shape a culture that gives purpose and meaning to work, stage organization drama for internal and external audience, and build team spirit through rituals, ceremonies and stories. It is associated with the culture of the organization. Metaphorically, the organization can be thought of as a theatre or temple.The four frames are powerful because of their ability to spur imagination and generate new insights and options. But each frame has limits as well strengths and each can be applied well or poorly. The structural frame risks ignoring anything that falls outside logic and written rules. Overreliance on the human resource frame results in romanticizing the relationship between the organization and the employees and ignores the harsh realities of symbols, rules, power and politics. The political frame imprisons people and causes conflicts along the way as any action could be viewed as a threat to one's position. The symbolic frame needs a deep understanding of culture and perceptions; its implementation needs high artistry skills. If wrongly implemented, it could result in embarrassments rather than boosting energy. The book is written in an enjoyable narrative style. With the examples provided, you will be able to understand and interpret different events at your organizations that you have probably wondered about. This is a great book not only because contains an extremely useful model to understand organizations but because in the process of explain how it works, summarizes many of the best business books on organizational behavior, change and leadership. So you are reading one book but referring to many other excellent literature on this topic as you advance. The four frames (structural, human resources, political and symbolic) are a great resource to understand organizational "reality" from very different but complementary views.Highly recommended. This is one of my grad school texts that I kept and still go back to. I find org theory fascinating, and likewise this book. It is accessible, interesting, and relevant to what we all do every day. This was a school text, however, it is a keeper. If you forget how to put things into perspective at work or in other organizations, this will help guide you to broaden your view. This is a great book for anyone in a leadership position. It is current with today's issues and industry. The book is presented in a more narrative style using relevant examples. This is not a technical how-to book, but rather a presentation of tools to help facilitate change, implement vision, and be a diverse leader. Why am I reading books on organizational theory and leadership? Well, the convenient answer is that they are required for a class at Fuller. But to be frank, I'm faced with leadership and organizational challenges in my work just like everyone else. Honestly, I was bit surprised at how helpful I found this one in particular. It's a whopper of a book at almost 500 pages long. But below I'd like to do my best to offer a review of this tome and how I found it beneficial to my work in Christian ministry.Reframing Organizations amalgamates the full breadth of respected research on organization and leadership. 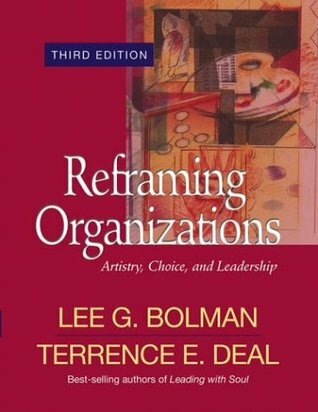 The authors summarize good leadership as that which is able to view an organization through four distinct “frames,” use these frames to assess the condition of the organization and determine how to actuate the measures necessary for achieving its goals.The four frames offered by Bolman and Deal are structural, human resource, political and symbolic. I found the term "frame" to be a bit problematic when trying to explain this. The frames are meant to address how we perceive the organizations we work with. And not one frame will suffice. As chapter twenty illustrates well, reflecting on an organization through all four provides a more complete perception of a particular scenario allowing an increasingly creative and thorough response. With this in mind, I will often refer to the frames as "lenses. "The structural lens (Part Two) is concerned with organization, structure, hierarchy and division of labor. The human resource lens (Part Three) is concerned with the needs of those inside, and influenced by, the organization. The political lens (Part Four) looks at negotiating and leveraging power and influence to meet the goals of the organization. The symbolic lens (Part Five) assesses opportunities to create symbolism and ritual that will cast vision and raise spirits of those within the organization.At first glance, we either automatically pigeon-hole our organization or just write off this approach as simplistic, modernistic or just plain un-churchy. But the book does offer a balanced analysis of what it means to be a thoughtful, creative leader within any organization, even a church. Their research looks at a broad spectrum of people gathered together for a particular purpose (an organization) in different arenas. The trouble is that several of the authors' lenses imply a metaphor that will make us uncomfortable in reference to the church. For some the political lens makes us uneasy. For others, the structural or human resource lens. So, would this information be helpful to a church?Reframing ChurchThe answer is, yes. The book is in great part concerned with reframing how we look at situations so that we can work together better. And what Christian community doesn't need to do that? But, I also found myself taking this question down a theological rabbit trail, potentially away from the practical side. In trying to answer this question from a theological vantage point, I began to look at a book I read a few years ago, John Driver's Images of the Church in Mission. In his preface, Driver states, "The Bible employs a rich variety of metaphors that illumine our understanding of the identity and the mission of the church." He goes on to categorize the metaphors for the Church on mission into four sections: Pilgrimage Images, New-Order Images, Peoplehood Images, and Images of Transformation. While I admit they are not a perfect fit for Bolman and Deal's "frames" the images are helpful in putting the tools these authors provide into the context of the church.A Pilgrim PeopleDriver's pilgrimage set, relates to images such as "The Way," "Sojourners" and "The Poor." Here Driver looks at the Scriptural metaphors that direct how the church relates to both members and those outside of itself. Applying Bolman and Deal's human resource frame, the local church is concerned with the development of people within the congregation and those impacted by its ministry. Read alongside Driver's pilgrimage images, the church leadership might determine whether or not their members are truly sojourning–on a journey–or at a place of stagnation. The church might assess their relationship to the "stranger and alien." Do they embrace a biblical image, or have they adopted another for how to address those in their midst but not of them?Symbols of a New OrderThe symbolic frame is perceivably the easiest to find a correlation with the church. Driver's new-order images of "the Kingdom of God," "New Humanity and "New Creation" seem the most appropriate. The stories in Scripture that draw out these metaphors, give us many of our rituals and invigorate our imaginations for what is to come are what has animated Christians throughout the ages. While different theological intricacies are applied in many churches, it remains that these central symbols are what make what we do important. Bolman and Deal write that when these images are communicated in a manner that is aligned with our practices it will "... deepen faith; otherwise, they become cold, empty forms that people resent and avoid. "Politics of TransformationBolman and Deal's political frame is concerned with power. While Driver's new-order images may seem the obvious correlation, I believe his images of transformation provide the appropriate lens for understanding the political frame within the church. These images include "Salt," "Light," "City on a Hill," "House" and "Witnesses." It is within these images that we see how the church-as-organization negotiates with the world. As Bolman and Deal write, "The question is not whether organizations are political but what kind of politics they will encompass." The images of transformation inform the church of how it engages, influences and participates in the transformation of cultures. This might ring of colonialism for some. Let me simply ask, do images such as "salt" and "witnesses"–as understood in the early church (they all died)–call us to a particular kind of engagement?Structuring a PeopleI end with the frame Bolman and Deal began with, the structural frame. Within the church, Driver's peoplehood images find correlation here. Images such as "flock," "people," "family" and "body" all allude to how the church ought to be organized. Within these metaphors we find our objectives and goals; we know Who is in charge and who is to follow and how to relate to each other. It is easy for the individual to get lost when the focus is simply on getting this frame "right." The challenge is that, as Driver points out, there are several images provided by Scripture that offer a vision for how we are organized. Not one alone works. Bolman and Deal speak about finding an "equilibrium" that, in our case would take the neighborhood, specific ministries and resources of the congregation into consideration.When I first picked up Reframing Organizations, the size was daunting and the subject matter appeared intimidating, and possibly boring. Yet, when finished, I had a deep appreciation for the content. The four frames, paired with Driver's four image sets, provide a way to “listen” to a faith community in context, discerning what is out of place, what is needed and what you can participate in reframing things. This book was given to me by one of my mentors, when I asked what her favorite books on leadership were. We agree that a lot of leadership and business books are junk, but she felt that this book was really worth the time and had a dog-eared copy to prove it. It outlines four "frames" for looking at organization and its issues: structural, human resource, political, and symbolic. It then shows you the benefit of approaching each issue/organization with intentionality, looking through each of the frames for potential solutions.At the initial meeting when she recommended the book, she gave me a brief rundown on the frames. We talked a bit about which of the four "frames" she tends to favor, and which she knows to be her least favorite. I read the book keeping those thoughts in mind. I also thought about my perception of how previous and current colleagues may approach view their work through the frames, and how I think I subconsciously apply them in my own work. (I waver between structural and political, I think.) Until last year I'd only worked in small organization teams. Now I'm part of a much larger structure, and there are a lot more personalities to consider. It's a lot to think about - this is a dense book, though an accessible read - and I'm looking forward to discussing it more. I'm not a management specialist but this was still very easy to read. A lot of great examples. This will be the perfect guide in my future career. Good techniques and ways to analyze and handle many problems. A bit repetitive though, hence the 4 stars. This is a very involved text, but it is an excellent guide for those interested in becoming leaders in their field. After reading this book, I have a better understanding of myself as a potential leader, where I need to be more flexible in other areas, and how I can continue to grow. This is a helpful book to (1) remind you that there are many perspectives to any given situation or organization, and (2) equip you with additional tools to observe and respond to needs in your organization. THOROUGH. And despite its length, relatively easy to read. All of the other books you've read about business and leadership? Odds are they make an appearance in here. In a fantastically useful, easily usable format. A classic on organizational structure. The four frames are very helpful when thinking about leadership. Actually read the 5th edition. Organization of the book around the various frames of leadership was very effective. Textbook for Organizational Behavior - definitely a keeper. Easy to read and understand the four frames. Written with a business slant but easily applicable to public sector as well. Awesome book. Easy to read and comprehend. Very dense, but it had excellent stories that made it quite entertaining. "They gave us lousy jobs and pay, order us around --never telling us what is going on. Then they wonder why we don't love our work. "This was textbook for an Organizational Behavior course in grad school. Very solid resource. Some random notes (not a summary of the book):When things go wrong, we: blame people, blame bureaucracy, blame thirst for power.Four principles of successful structural change:1. Study existing structure to understand what works and what doesn't.2. Develop new conception of organization goals and strategies in tune with challenges and circumstances of the times.3. Design new structure in response to changes in goals, technology, and environment.4. Experiment as you go. Retain what works and discard what doesn't.Herzberg's three critical factors in job redesign:1. individuals need to see work as meaningful and worthwhile. More likely when jobs produce a visible "whole".2. Individuals need to be able to use discretion and judgment so they feel personally accountable for the results.3. Individuals need to receive feedback so they can improve.Change agents fail when they rely mostly on reason and structure while neglecting human, political, and symbolic elements. No, there's no universal law of leadership, no uniform path to success, no magic and no secure predictions.Instead, leadership is a combination of perspectives and skills. It encompasses structures, people, politics and symbolic realities. Different perspectives are relevant for different situations, and in the end, ethics, artistry and luck might be the difference between success and failure. Reading this book has reinforced my belief being a good and skilled person is essential for leadership. Leaders are not alone and never omnipotent. They depend on the team and how they relate to fixed and fluctuating surroundings. This book puts some tools, some stories and some thoughts in your toolbox, in the end you have to create your own, but perhaps with more courage and creativity after reading these perspectives. Finally - finally - a good and effective book on leadership, management and organizational culture. This book is clear, but not simple. In fact, the book argues that simplifying concepts, ideas and theories is profoundly destructive for organizations.Most powerfully, Bolman and Dean explain the reasons for the vertical and lateral configuration of organizations. They argue that the whole point of line management and committees - the death of individual innovation and imagination - is to crush individual agency and choice. The point is to create consistency. The cost is flexibility, space, diversity and innovation.I don't think consistency is worth this cost. This fine book explains the rationale for this cost, but also its consequences. Reframing Organizations by Bolman and Deal is an easy read from start to finish. The two really did their homework in finding examples of many structural styles that go on mainly in the business world. Although I would recommend this book, I have two quams. The first is that there are not enough Disney references. When your main goal is to talk about the successful structure of business, Disney needs to be included. Second, Bolman and Deal reach with their examples, sometimes, attributing the failure or success of a company to a single structural practice-my quam is that it's just oversimplified, but overall good read! This is the first book I've read on organizational theory, and while I was skeptical, it does have some interesting insights. It goes through the four ways to view organizations or general issues: structural, human resource, political, or symbolic. Understanding the four frames and being able to "reframe" any situation to better understand what is really going on and how to solve problems can be very useful, especially for administrators/managers. I wouldn't recommend this as light reading, but if you are curious about how to come up with more helpful solutions for overwhelming organizational problems, this is a good option. Excellent text. It provides background literature, evidence, and advice for looking at situations from four perspectives (structural, human resource, political, symbolic). Great for leaders to use when reframing an issue, problem, or change effort when feeling stuck or ineffective. The four frames offer tools and resources that can help. Supports my perspective of coaching and positive psychology that means using reframing to work around obstacles and remove barriers in order to achieve goals. Even though this was a required text for AEL, I thought it was very good. The frames of organizations were well laid out and included examples. The writing was such that I interacted with the book. I could picture the frames in my school, and see the frames that were at play at previous organizations. While I have never thought of frames in my educational beliefs, I see where my values lay in those frames. I also see how the other frames influence how I feel and why I feel comfortable, valued, and part of the team at my current school. Pretty good book. Seems like the authors fall into a long line of those wanting to create a catchphrase for leadership (i.e. Kouzes & Posner, Tichy, etc.). The reframing concept is incredibly viable if one keeps in mind that the frames don't operate in a vacuum. They are related and affect one another. I especially enjoyed the last few chapters where the "act" of reframing was tied together.I would definitely recommend this book to anyone interested in organizational cultures - leading, forming, revising, etc. I read this book as a part of my course requirements for my Masters of Education in School Administration.This book gives a very good outline on how to conceive of organizations from multiple perspectives and to consider multiple solutions and alternatives to leadership challenges. I appreciated the detail and consistency throughout the book.I especially appreciate Bolman and Deal's perspective that there is no surefire program to create perfect leaders, but rather that leading is an artistic endeavor that depends more on spirit than on structure.Solid read. Worth the effort. Bolman & Deal take on organizational management Malcolm Gladwell-style, weaving in stories from fortune 500 companies, school systems and government agencies. Yet, they do so without any acknowledgement of the differing missions and goals of these distinct sectors. Moreover they show preference for the for-profit sector by assuming the audience's key concern is profit, utilizing for-profit examples much more often and generally being apologetic toward the ultimate 1%ers. This was a textbook we used in the Abilene Christian University's Masters program in Conflict Resolution. Bolman & Deal do a great job helping you understand different frames of reference, including the political and symbolic. It's well laid out and written in every day language, making it easy for the non-student to appreciate its concepts. I have used the book to change how I lead my team and refer to it regularly.